GH Neon 17N is an outcross sire with tremendous carcase and performance. We have been very pleased with the extra thickness and weight for age his progeny display. His calves have a low birth weight and grow out really well; he is a Trait Leader for 200wt, 400wt, 600wt, EMA, RBY & IMF. 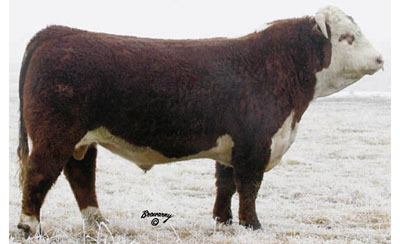 A Neon son, Rambo, was the number one carcase bull in North America in 2005, Grant Hirsche sold a half share in the young sire for $135,000 (CAN). Neon sons at Mawarra include $48,000 M. Trail Blazer, Hereford National Grand Champion 2008, $32,000 M. Unique Hereford National Grand Champion 2009, $15,000 M. Undefeated Hereford National Reserve Senior Champion 2009 and $21,000 M. Vice Regal, who won his class at the Hereford National in 2010 & sold for the second top price of the sale. Neon’s eight sons, at Mawarra, have recorded an average of $16,500. We have retained another son, Vice Chancellor, as sire. Glen has been buying bulls from Mawarra since 2002.